Lack of new news concerning a U.S. and China trade deal plus an improving long range U.S. Midwest weather forecast may have weighed on prices. Talk of higher South America crops and their prices below U.S. may have also triggered new selling. Weekly U.S. soybean exports are slowing and U.S. demand needs a China deal. Most estimate U.S. 2019 soybean planted acres near 84.6 million versus 89.2 last year. 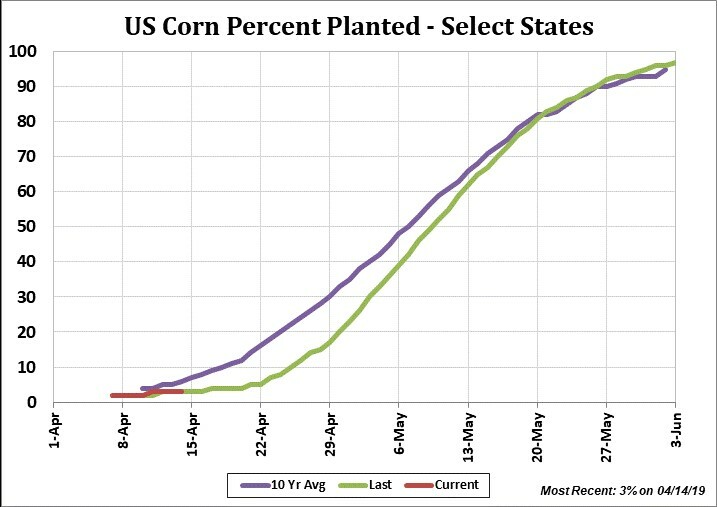 This is expected to produce a crop near 4,300 mil bu vs 4,544 last year. Some estimate total U.S. demand near 4,350 mil bu vs 4,102 this year. Key will be exports with some estimating exports near 2,100 vs 1,875 this year. This would leave end stocks near 875 vs 900 this year. Some could see 2019/20 World soybean crop near 368.5 mmt vs 360.5 this year. This includes a Brail crop near 126.0. 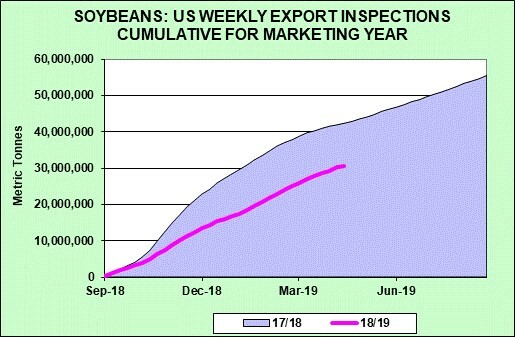 Private crop watchers raised their estimate of the 2018/19 Brazil soybean crop to 116.0 (USDA 117.0). Lack of new news concerning a U.S. and China trade deal plus an improving long range U.S. Midwest weather forecast may have weighed on prices. Talk of higher South America crops and their prices below U.S. may have also triggered new selling. Weekly U.S. corn exports are slowing and U.S. demand needs a China deal. The U.S. Corn plantings is 3% complete versus 5% average. Most estimate U.S. 2019 corn planted acres near 92.8 million versus 89.1 last year. This is expected to produce a crop near 15,100 mil bu vs 14.420 last year. Some estimate total U.S. demand near 14,925 mil bu vs 14,765 this year. Key will be exports with some estimating exports near 2,300 vs 2,375 this year. This would leave end stocks near 2,160 vs 1,835 this year. Some could see 2019/20 World corn crop near 1,106 mmt vs 1,107 this year. This includes a Brazil crop near 99.0. Private crop watchers raised their estimate of the 2018/19 Brazil corn crop near 96.5. Wheat made new lows on talk of improving Russia, EU and U.S. weather outlook. Slow U.S. export demand is also limiting new buying. Most estimate U.S. 2019 wheat planted acres near 45.7 million versus 47.8 last year. This is expected to produce a crop near 1.935 mil bu vs 1,884 last year. Some estimate total U.S. demand near 2,075 mil bu vs 2,073 this year. This would leave end stocks near 1,110 vs 1,055 this year. Some could see 2019/20 World wheat crop near 770.0 mmt vs 733.0 this year. This includes a Russia crop near 83.0 versus 71.7 this year. The U.S. Spring Wheat crop was 2% planted versus 13% average. A change in the wet spring pattern could help speed up 2019 plantings. 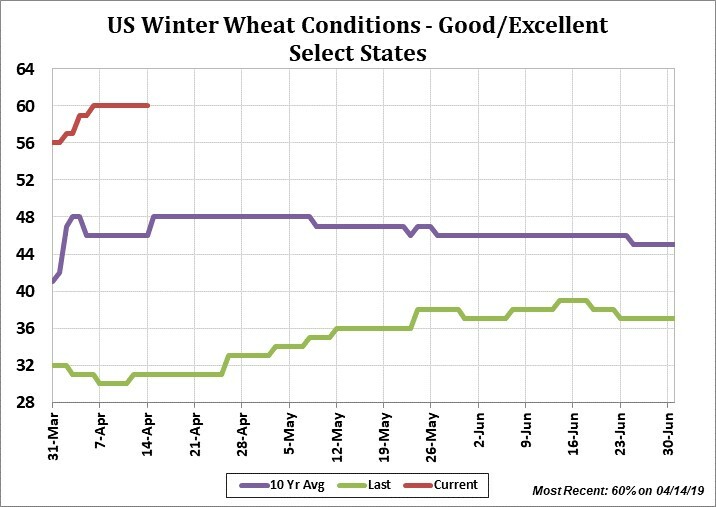 The U.S. Winter Wheat crop was rated 60% good to excellent versus 31% a year ago. This higher than average rating could be weighing on wheat prices.